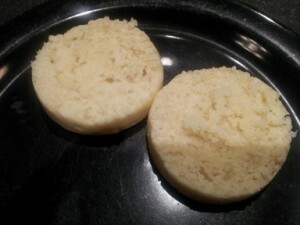 One-Hour Buttermilk English Muffins | Have YOU Ben Starr Struck? I used to be grossed out by packaged English muffins. In fact, all packaged breads give me the creeps. I just can’t buy them. If they’re not sitting in the open air on the shelf of a bakery, and I’m confident they came out of the oven that day, I can’t bring myself to buy them. Maybe that’s why I make the majority of the bread I eat myself. Before I went on MasterChef, I had this intuition that there would be an Eggs Benedict challenge, and until that time, I had never even eaten Eggs Benedict, OR its most integral parts…the poached egg or the hollandaise. (Seriously!) I’d heard horror stories about restaurant hollandaise and how poached eggs would kill you, so I had always just avoided it. But since I knew I’d probably have to make it on MasterChef, I set about learning how to make the famous dish. And due to my aforementioned aversion to packaged English muffins, I knew I was gonna have to make my own from scratch. So after a bit of tweaking, I perfected a batter-based English muffin recipe using one of my favorite ingredients…buttermilk. This recipe takes less than an hour from start to finish, yet is fully yeast-risen. Enjoy! Stir the yeast and sugar into the warm buttermilk. Then look at the markings on the measuring cup. You should see that you have just a bit more than 1 cup. Set the cup in the warm oven for 10 minutes. In that time, the volume of the mixture will lift to around 2 cups. This is how you know your yeast are active and happy. If your volume stays the same at around 1 cup, your yeast is dead (old yeast, or buttermilk too hot) or feeling sluggish (buttermilk too cold). 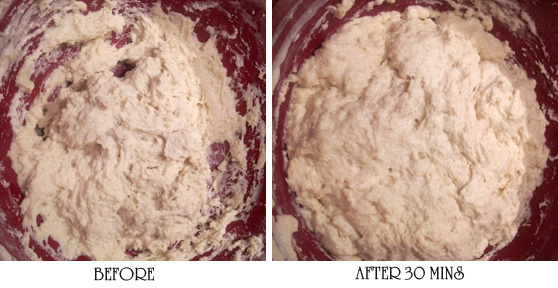 Recommendation…start over with fresh yeast! Most older recipes tell you sift your flour. I almost never do that. But in this case, its important to aerate the flour for a speedier rising. (Yeast need oxygen!) 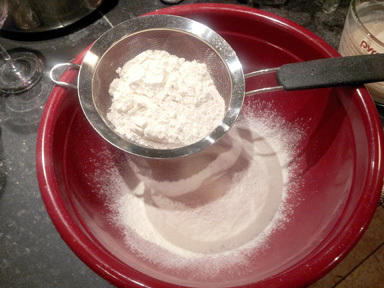 Just measure out a cup of flour, pour it into a strainer or sifter, and dust the flour into the bowl. 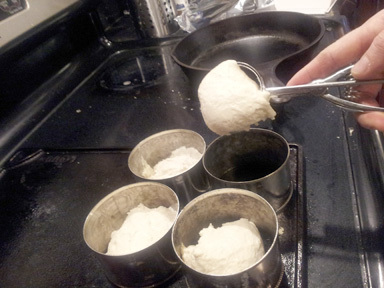 Sifting is mostly a thing of the past, unless you are rapid-rising yeast dough! Stir all this around with a wooden spoon until you have a stiff batter. Cover with plastic wrap and set it into the warm oven for 30 minutes. In that time, the batter will double or more. Stir well. The batter will deflate and become very sticky. Re-cover with plastic wrap. Place a griddle on the stove over medium-low heat. (I use a cast iron griddle, but any one will do.) You want the griddle at 300F for cooking the muffins. If you’re geeky like me and have an infrared thermometer, you’ll know exactly when your griddle is ready. If you don’t, you can do the sorely inaccurate water test…toss a few sprinkles of water on the griddle and the bubbles should just dance around lightly on the surface, rather than immediately evaporating away into steam. For this recipe you will also need rings. Alton Brown says to use tuna cans with the tops and bottoms removed, however, most modern tuna cans can only open from one end. I found that pineapple cans could be opened top and bottom, and I used the newer-style of can opener that doesn’t leave a sharp edge. I have 4 of these and have used them for years. You can also buy purposed cooking rings at any nice kitchen store or restaurant supply, but you’ll pay more for them! Another tool that makes this recipe easier is a large ice cream scoop with a squeezable handle. Alton Brown calls this a #20 scoop, but I’ve never seen it marketed that way. It has a capacity of about 1/4 cup, and I’ve only seen 2 sizes of this type of scoop sold. I have BOTH of them, I use the smaller one for Chocolate Chip Cookies and the larger one for muffins and cupcakes. NEVER for ice cream! Ha ha ha… If you don’t have one, just use a 1/4 cup measuring cup, but your fingers will get really sticking raking out the batter. Spray the griddle and the inside of the rings with cooking spray. Then place a generous scoop of batter into each ring. Cover with a sheet of aluminum foil and cook for 5 minutes. Flip them (I use tongs, because a spatula is kind of awkward for flipping these) and cook them, covered, another 5 minutes. Remove to a cooling rack and jiggle the muffin out of the ring. Re-spray and return the ring to the griddle for the second batch. I usually get 6-8 muffins from this recipe. Let the muffins cool. Instead of cutting into them with a knife, insert a fork into the middle of the muffin all the way around the edge, then peel open. This keeps all those famous “nooks and crannies” from closing up. You will NEVER EVER go back to storebought English muffins after tasting these! This recipe may sound complex, but after you make them one time, you’ll see how easy they are! I’ve just given you exhaustive detail to help ensure success. Enjoy! This entry was posted in Breakfast, Recipes, Vegetarian, Yeast Breads and tagged muffins, quick rise, yeast. Bookmark the permalink. You don’t use cornmeal to keep them from sticking, are they more like biscuits, if you use cooking spray rather than the cornmeal? Also, if the pan/griddle is to be 300 degrees F, why can’t you put them in the pan/griddle with a lid on and set the pan in. 300 degree oven for 5 minutes, then take the pan out, flip them over and put it back in for another 5 minute So? Wouldn’t you get the same result? Dee, they are nothing like biscuits…biscuits are flaky, these are yeasty and chewy, like a traditional English muffin. In my experience, the cornmeal burns when cooking them on a griddle, which is why I use spray. A 300 degree cooking surface (direct conduction) is FAR hotter than a pan inside a 300 degree oven (indirect radiation)! The muffins will take far longer to cook, even in a 400 degree oven, than they will cooking them directly on a 300 degree surface. That’s not to say that you CAN’T cook them in the oven, but I’d use 375-400 degrees for 10 minutes, and then flip for an additional 10 minutes. (That’s just a guess, they may not be done by that point.) Cornmeal may work fine without burning at that temperature.